"A great company dish. I adapted this from a friend's New Orleans recipe. Serve over steamed rice or pasta. The 'KJ' is my son, who loves this!" In large skillet melt butter or margarine. Season chicken with salt and pepper to taste. Add chicken to skillet and brown on both sides. Remove from platter and keep warm in oven. Reduce heat under skillet to medium low. Add flour to pan drippings, stirring constantly for 2 minutes to form a roux that is golden brown. Stir in broth gradually; continue to stir until thickened. 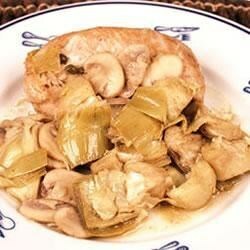 Stir in the lemon juice, mushrooms, artichoke hearts with liquid, and Worcestershire sauce. Let simmer for several minutes. Return chicken to skillet. Cover and simmer for another 20 minutes, spooning the sauce over the chicken occasionally. I have had this in a fancy restaurant, & this recipe tastes better! I cut the chicken into strips & served on top of thin spaghetti though. Wonderful company dish. Very impressive, but easy! I added a little garlic and a splash of white wine. Our new dinner for special nights. Thanks!! This was easy to make and it tasted wonderful. The only thing I will change the next time is to cut back on the liquid, so that the sauce will be thicker.